(CNN) -- Rosa Parks, who helped trigger the civil rights movement in the 1950s, died Monday, her longtime friends told CNN. She was 92. Parks inspired the civil rights movement when she refused to give up her seat on a bus to a white man in Montgomery, Alabama, in December 1955. Her arrest triggered a 381-day boycott of the bus system by blacks that was organized by a young Baptist preacher, the Rev. Martin Luther King Jr., and led to a court ruling desegregating public transportation in Montgomery. Parks, a seamstress, facing regular threats and having lost her job, moved from Alabama to Michigan in 1957. She joined the staff of U.S. Rep. John Conyers, a Michigan Democrat, in 1965, championing civil liberties. Parks later earned the Presidential Medal of Freedom and Congressional Gold Medal. Conyers, who first met Parks during the early days of the civil rights struggle, said Parks died in Detroit Monday evening. "I think that she, as the mother of the new civil rights movement, has left an impact not just on the nation, but on the world," he told CNN in a telephone interview. "She was a real apostle of the non-violence movement." Conyers said Parks worked on his original congressional staff when he first was elected to the House of Representatives in 1964. He remembered her as someone who never raised her voice -- an eloquent voice of the civil rights movement. "You treated her with deference because she was so quiet, so serene -- just a very special person," he said, adding that "there was only one" Rosa Parks. Gregory Reed, a longtime friend and attorney, said Parks died between 7 p.m. and 8 p.m. of natural causes. He called Parks "a lady of great courage." 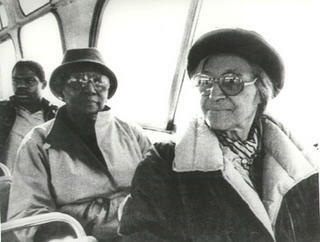 Parks was the subject of the documentary "Mighty Times: The Legacy of Rosa Parks," which received a 2002 Oscar nomination for best documentary short. In April, Parks and rap duo OutKast settled a lawsuit over the use of her name on a CD released in 1998.
hey speaking of free things try nobel peace prize winnerblingo, its free to sign up and you can win free prizes! I just won a free movie ticket!